I'm born and raised in Canada, but I have to say I've always had a love for other parts of the world. I love living in Canada and being Canadian, and have a love for all types of art. I guess you can say I'm a bit of a dreamer, and wish to someday travel the world to enjoy a wider range of art. I have been working with an awesome website for a number of years now, which is a site that showcases artists from around the world, and you're able to purchase their art: NOVICA. They are in association with National Geographic, and everyone has heard of them! There's also another site powered by NOVICA and that's the UNICEF Market... which is a similar site like the others, however, their mission is to save and protect children from around the world. The site features artists from around the world: Andes, Bali and Java, Brazil, Central America, India, Mexico, Thailand, and West Africa. By purchasing from NOVICA or UNICEF Market, you're helping those smaller companies and artists that may not have that much money. They sell all kinds of items that would make for perfect gifts... women's robes, sarongs, floral bracelets, sterling silver filigree earrings, and much more! I personally have a love for anything unique, that would be hard to find anywhere. I like decor items that make for excellent conversation starters, and I love adding to my collection. What I love about both sites, is that you're able to create and share collections to your friends... almost like a wishlist. Create your collection on the UNICEF Market site, and you have a chance to win a trip for 2 to Machu Picchu with Smithsonian Journeys! Currently on order: Perfect Holiday Gift! I've been fortunate to be able to review items quite a few times in the past, and have always been 100% satisfied each time... not only have I reviewed items, but I've also purchased items on my own as gifts from the company. Yes, I like them that much that I've spent my own money! 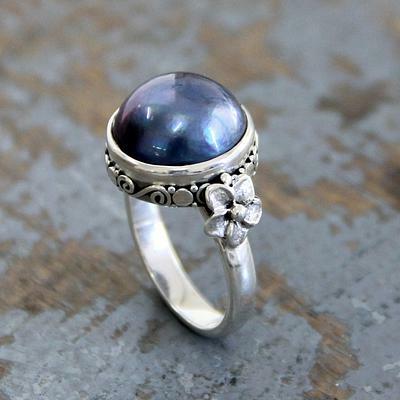 I was sent a gift certificate via email to purchase an item of choice worth $50USD, and the item that I selected was the Indonesian Sterling Silver Pearl Cocktail ring in "Dark Glow". The company tends to do it this way, so that we get the full customer experience like any other customer. When I saw the picture of the ring, I instantly thought of my mother... my mother's birthstone is pearl, and her favorite colour is blue = the perfect gift! I had given her a silver ring last year for Christmas, and somehow it's been misplaced... so seeing this one comes at the perfect time. Since I just ordered the item this past week, it hasn't arrived yet. Once it does, I will be sure to share some photos of the gorgeous ring... I can only imagine how pretty it is, as I know from experience that they look more beautiful in person. Interested in grabbing something from them? Of course you are, their items are gorgeous... click here to for the UNICEF Market! Interested in checking out their Facebook, Twitter, and Pinterest? Of course you are, you never know when you may come across a deal! UNICEF Market is joining in my Holiday Gift Guide 2016 set of giveaways! Yippee... what does that mean? Well, one lucky person will win a $50 gift certificate from UNICEF Market! So stay tuned for the giveaway post, that will go live in November!